Rummy Circle offers a wide range of tournaments and promotions. Sunday Million is the latest rummy tournament hosted in Rummy Circle offering players the opportunity to win millions in prize pool. The Sunday Million tournament at Rummy Circle is the best rummy tournament as it offers an amazing prize pool. Rummy Circle never turns down their players when it comes to offering the amazing promotions and tourneys. Sunday Million tourney at Rummy Circle is designed for the high rollers and the prize pool is a whooping Rs. 15 Lakhs per tournament. December is the month to celebrate and you can enjoy the Sundays by taking part in this amazing tourney at Rummy Circle. 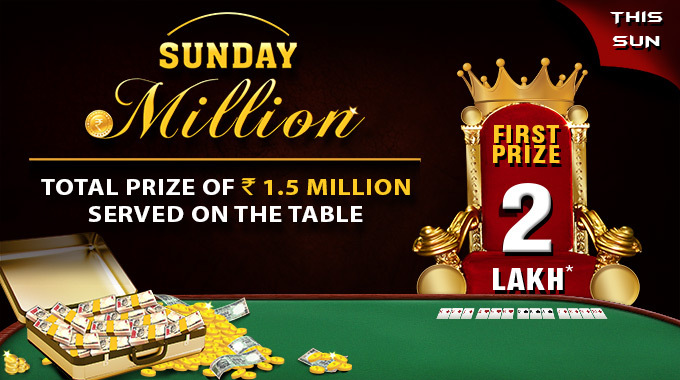 The Sunday Million tournament is an amazing chance for the winner to bag Rs.2 lakhs in a go. The entry fee for the Sunday Million tourney is Rs.5000, register on the day of the tourney and win from the prize pool of Rs.15 lakhs. So if you are game for the special tournament at Rummy Circle, save the date and register before you are out of seats. Participate in this amazing tourney and do let us know how this special tourney went for you. Also comment below you reviews on the games that are hosted on Rummy Circle.